As you may have noticed, ours is the era of the mega-gift. This trend of non-stop blockbuster giving has left many reeling or salivating – not to say that the two are mutually exclusive, nor will this trend be ending any time soon. Wealth and philanthropy are often perceived to fit hand in glove, but we prospect researchers know firsthand how difficult it can be to verify wealth and encourage charitable giving. Non-profit organizations announcing a campaign gift, pledge, or bequest as their “all-time largest donation” (my current favorite example: an anonymous $40 million gift to Gustavus Adolphus College) may have begun to feel very commonplace. What does it mean when these announcements no longer feel special? Or positive? I stand by this statement. My intent is not to defend the activities of ultra-high net worth (#UHNW) individuals, they certainly don’t need my help (should you feel otherwise, Mr. Buffett, please shoot me an email), but I will defend charitable giving and the importance of donor intent. 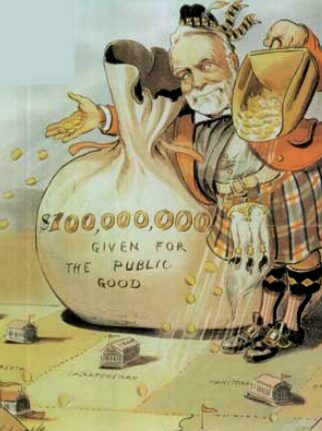 Until there are widespread political solutions to social ills, we should stop praising hugely wealthy philanthropists … Philanthropy, if you define it as the deployment of private wealth for some public influence, is an exercise of power. In a democratic society, power deserves scrutiny. But contrary to the old saying, this is one gift horse we should look closely in the mouth. Refining my defense of Paulson in 2015, I wonder if the press – and perhaps the public at-large – could be experiencing mega-gift fatigue? Similar to donor fatigue, I define this feeling as a shrinking interest in responding generously to charitable gifts supported by extreme wealth although large donations were cheered in the past. I am deeply concerned by attempts to frame philanthropy as a tool used by UHNW individuals knowingly to undermine democracy. The new mega-givers are not the villains in this story…[Jim] Simons and other high-minded donors like him are coming along at a very fortuitous moment, and we should indeed be thankful as more of them step forward. Most are just trying to do the right thing. But as their power grows, so, too, must the scrutiny grow of how that power is used, along with the larger changes in U.S. society that are acting to amplify that power. It is no exaggeration to say that we live today in the second golden age of American philanthropy. Growth in inequality might be a foe to civic comity, but it is a friend to private philanthropy. Rethinking philanthropic freedom is a Pandora’s box that almost nobody want to open. As we members of the HBG Book Club debate the points in Callahan’s book and in the many collateral articles we have been tossing back and forth for discussion in our chat room, we’ve come to agree that maybe it’s time to open that Pandora’s box.